What am I thinking about the way a doe is acting? How do I know she is in labor? Why am doing what I’m doing? What are our options, and what are the pros and cons of each? When am I worried — or not? How do I know the kids are okay? How do I know a doe is done having kids? If you’ve ever wished that you could spend a couple of weeks with an experienced goat breeder during kidding season, this is your chance. As with all my classes, each video will have an accompanying discussion board, so you can ask questions. Registration will be open in January 2019. To be sure you know when registration opens, provide your name and email address below. What do current students say about the course? This course, experienced at my own pace, has been invaluable in giving me more confidence going forward with our own home dairy. Deborah’s explanations of what the audience is seeing puts everything into perspective. There are complications of birth and raising kids that I hope to never experience, but seeing them through Deborah’s eyes first will hopefully fortify me if necessary. Thank you! The secondhand experience makes me feel like I know a little bit more! I think some of the longer clips of “nothing really happening” and the time stamps are great for letting people feel that it’s okay to be watching and waiting for a while as long as there’s progress. And watching a bottle baby absolutely refuse to eat — I would have had no idea and would have flipped out a little if I’d experience that for the first time without seeing it happen to you! 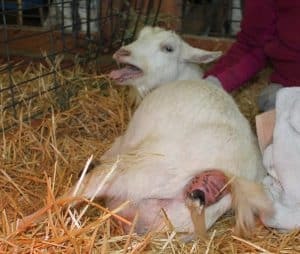 Join the wait list for the goat birthing course! Success! We'll send you an email when the course is open for enrollment in January!